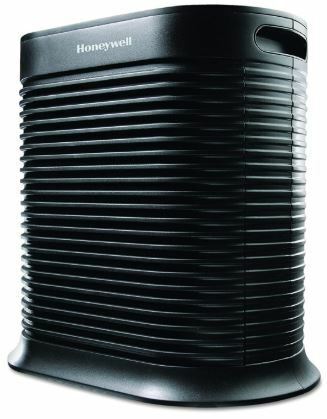 The Honeywell HPA300 is one of the most popular HEPA air purifiers sold today - with over 2,000 reviews on Amazon. Using a dual-filtration process, the HPA300 removes all kinds of allergens from the air including tiny pollutants as small as 0.3 microns. 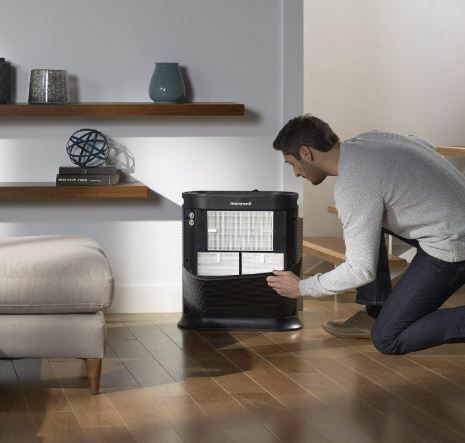 This Honeywell HEPA air purifier is rated for large rooms of up to 465 square feet, making it perfect for open-plan living areas, spacious bedrooms and other large indoor spaces. We love how quiet the HPA300 is - especially at low fan speeds. We also think it looks great with its all-black ribbed design. 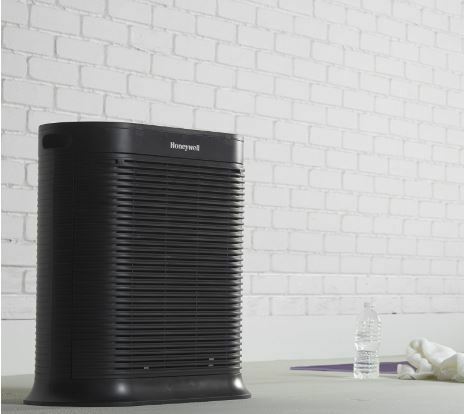 The Honeywell HPA300 HEPA air purifier is also surprisingly affordable considering its large-room capacity. This is why we picked it as the best value air purifier in our best air purifiers for mold 2019 guide. Easy to mount and to use – user manual is available. Once in the air purifier, the air goes through two filtration stages before it is released back into the room. 1. Pre-filter – The pre-filter has an activated carbon filter in it. It helps in absorbing VOCs, gases, odors and other large particles like hair. This filter requires replacement within three months. 2. 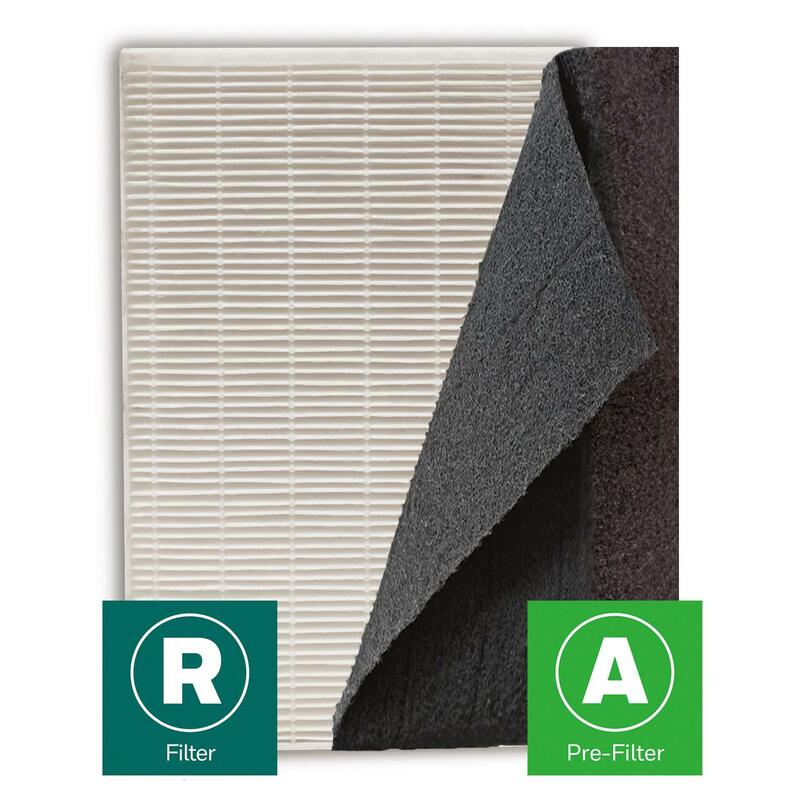 True HEPA filter – The pre-filter only removes large particles like hair while the true HEPA filter removes other smaller ones like Pet dander, mold, viruses, bacteria, and pollen. This filter removes at least 99.97 percent of allergens and tiny pollutants as small as 0.3 microns. The Honeywell HPA 300 covers a large are of up to 465 square feet. In this kind of space, the air purifier performs five air changes in one hour. This means that air will pass through the purification process again after every 12 minutes. The Honeywell Hpa 300 is equipped with 2 led filter replacements indicators. There is one indicator for each filter. This comes in handy especially to those who can’t remember the filter change dates. Large air purifiers are normally noisy. Though the Honeywell Hpa 300 is relatively big, it operates more quietly than similarly sized air purifiers. It specifically has a smooth and low operation especially when it is operating on lower fan speeds, and due to its easy noise operation it comes in handy as it can also operate at night without causing disturbances. The Honeywell Hpa 300 has a timer which you can set upon the duration you want it to run. You can set it to run at a value of two, four or eight hours. The Honeywell Hpa 300 has 3 fan modes: Allergen, General clean and germ mode. For maximum efficiency especially in extreme allergies situations, the turbo mode is the best as it maximizes the Honeywell Hpa 300’s fan speed. 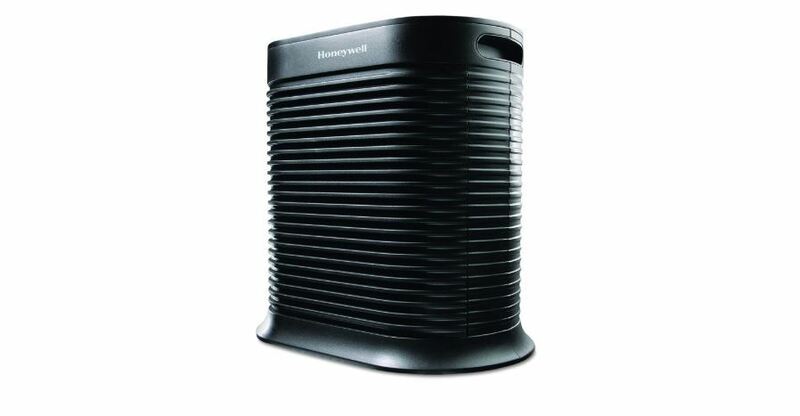 With its high-efficiency air purification process, the Honeywell Hpa 300 air purifier will need frequent filter replacement especially on the pre-filter which will need to be replaced after every three months. However, the HEPA filter may take a little longer to need a replacement as it may even go for a whole year without being replaced. Many makes of air purifiers are genuinely equipped with automatic smart features and this may work to its disadvantage as it lacks them. It is however equipped with a timer which you can manually set at different values of times to run through. 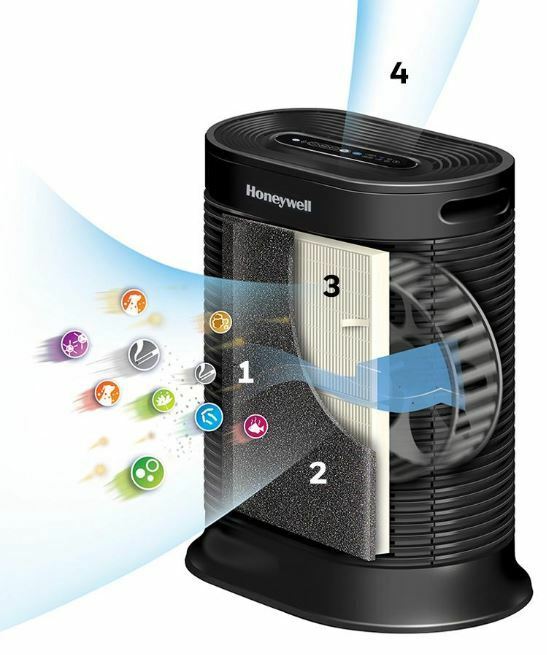 The Honeywell HPA300 is a decent air purifier that can effectively remove dust and smoke from your home without much issue. However, it lacks some convenient features such as an auto mode which would allow you to adjust it using remote control automatically. When working at full speed it can be a bit noisy but overall this air purifier ranks best for removing dust particles and other allergens, this comes in handy especially to those with asthma and allergens struggles. It is an ideal choice especially to those leaving in smoky and dusty areas.